Like most right-thinking people, I'm alternately puzzled and repelled by private equity. To be fair, I'm puzzled, mostly, at the people who aren't repelled by a field that somehow takes all the worst parts of accountancy, middle-school bullying, and train-spotting, and turns them into an occupation that brings in MBAs the way McKinsey once did. Nevertheless, it is striking that CalPERS (the California public employees retirement fund) wants more money invested in private equity, and wants it there so badly that a CalPERS executive was recently quoted as saying, "We need more of it, and we need it now". Nevertheless, the entire CalPERS meeting transcript on the topic is worth a read, especially if you mentally /s/r "private equity" for "Public Equities Around 1999" as you go along nodding your head at the Deep Investing Thoughts. 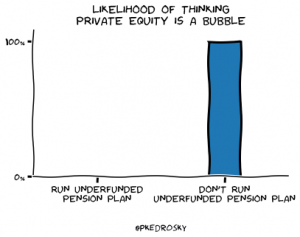 It becomes fairly clear that the key to convincing yourself that private equity is nothing even remotely like a bubble is having an underfunded pension plan. I remain fascinated by the studiously obtuse reactions to the college admission scandal thing. I'm sure my fascination will soon pass, but today's installment comes from the studiously obtuse New York Times, which opines that it's really a sports scandal, not an admissions scandal. This is impressive Shiny Object Over There work, and, most importantly, manages to avoid asking why sports is so important at colleges anyway. Say, for example, colleges wanted athletes there so that they could exploit them in some way, perhaps for other income, or even from fund-raising with alumni. I'm sure neither of these things happen, but, as a thought experiment, you could imagine there would be more reasons to run flawed athlete-related admission programs that could be exploited by the unscrupulous -- even if colleges claimed they were going to crack down on such programs to prevent further sports-related admissions scandal things.